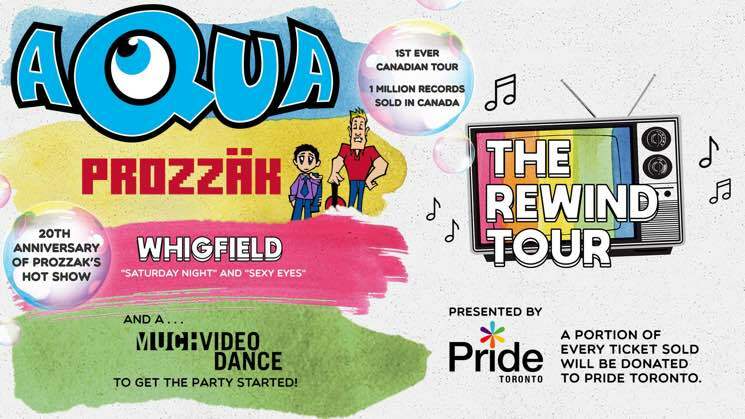 ​Aqua, Prozzäk and Whigfield Team Up for Canadian "Rewind Tour"
The '90s revival is far from over, at least if Aqua, Prozzäk and Whigfield have anything to say about it. The trio of blasts from the past will embark on a Canadian tour together later this year. Dubbed "The Rewind Tour," the jaunt will include stops in Toronto, Abbotsford, Calgary, Enoch, Winnipeg and London. Hiking the nostalgia up another notch, the Toronto date will also feature a Much Video Dance presented by Pride Toronto, so you can relive your awkward school dance days. Find full event info here. Tickets go on sale to the general public on Friday (June 1) at 10 a.m. local time. Find full details on the upcoming shows here via Ticketmaster. See the upcoming dates below. Prozzäk Premiere New Single "Love Me Tinder"